As an interface used for the intercommunication between the MA5600T/MA5603T/MA5608T and the MGC, the interface is vital to the SIP-based VoIP service. Therefore, to implement the VoIP service, the SIP interface must be configured and must be in the normal state. The IP address of the Layer 3 interface of the media and signaling upstream VLAN must be configured. For details about how to configure the IP address, see Configuring the Upstream VLAN Interface. The media IP address and the signaling IP address for the MG interface must be selected from the IP address pools configured here. The signaling IP address pool is used to store the IP addresses of the MG interfaces, and the media IP address pool is used to store the IP addresses of the media streams controlled by the signaling. The media IP address pool and the signaling IP address pool can be the same. Similarly,the media IP address and the signaling IP address can be the same. The MGCP interface on the MA5600T/MA5603T/MA5608Tdoes not support the isolation of media streams and signaling flows. Therefore, when the MGCP protocol is used, the media IP address pool and the signaling IP address pool must be the same. When the H. 248 or SIP protocol is used, the media IP address pool and the signaling IP address pool can be the same or different. 1. Run the ip address media command to add the media IP address to the media IP address pool. The media IP address needs to be selected from the IP addresses of the Layer 3 interface of the media and signaling upstream VLAN. state after you add it. One MA5600T/MA5603T/MA5608T supports up to eight SIP interfaces. Each SIP interface can be configured with the interface attributes separately. The SIP attributes configured for an SIP interface take effect on this interface only. The attributes of an SIP interface, including the signaling IP address, media IP address, transport-layer protocol, port ID of the transport-layer protocol, IP address (or domain name) of the proxy server, port ID of the proxy server, home domain name, profile index, are mandatory. In addition, the attributes of an SIP interface must be consistent with those configured on the IMS side so that the status of the SIP interface is normal. Step 1: Query the current voice protocol running in the system. Run the display protocol support command to query the voice protocol that is currently supported by the system. If the system voice protocol is the SIP protocol, go to Step 6. 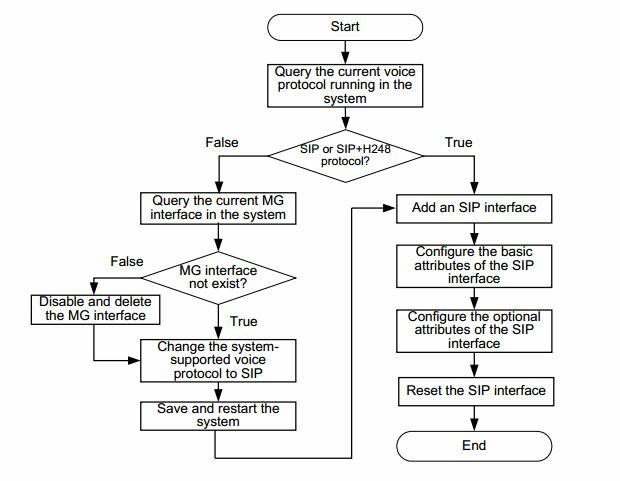 If the system voice protocol is not the SIP protocol, go to Step 2. Step 2: Query the current MG interface in the system. Run the display if-mgcp all or display if-h248 all command to query whether an MGCP interface or an H.248 interface currently exists in the system. If there is no such an MG interface, go to Step 4. If there is such an MG interface, go to Step 3. Step 3: Disable and delete the MG interface. 1. Delete the user data of this MG interface, and then run the shutdown(mgcp)or shutdown (h248)command to disable the MG interface according to the protocol type of the interface. 2. Run the undo interface mgcpor undo interface h248command to delete the MG interface. Step 4: Change the system-supported voice protocol to SIP. Run the protocol support command to change the system-supported voice protocol to SIP. Step 5: Save the configuration data and restart the system. Save the configuration data by running the save command. Then run the reboot command to restart the system to make the new configuration data take effect. Step 6: Run the interface sip command to add an SIP interface. Step 7: Run the if-sip attribute basic command to configure the basic attributes of the SIP interface. Step 8: Run the if-sip attribute optional command to configure the optional attributes of the SIP interface. the IMS-side support, and must be consistent with those on the IMA-side. After the SIP Interface Huawei OLT configuration is completed, run the display if-sip attribute config command to query the attributes of the SIP interface. Step 9: Reset the SIP interface. Run the reset command to reset the SIP interface for the new configuration data to take effect. Otherwise, the configuration data does not take effect but is only stored in the database. After the SIP interface is reset successfully, run the display if-sip attribute running command to query the running status of the SIP interface. If the active (or standby) proxy is up, the SIP interface is normal. …//The rest information in response to this command is omitted. Primary Proxy State up //Indicates that the SIP interface is in the normal state. After the SIP interface is configured, you can add plain old telephone service (POTS) users on the SIP interface to implement the VoIP service. This topic describes how to configure the PSTN user data (the same as the corresponding data on the IMS) on the SIP interface to provide the POTS terminal with the access to the network for VoIP service. You can add a service board in two ways (see the Usage Guideline of the board add command). It is recommended that you insert the service board into the planned slot and then confirm the board. 2. Run the sippstnuser add or sippstnuser batadd command to add the PSTN user. 3. Run the display sippstnuser command to check whether the PSTN user data is the same as that in the data plan. The attributes of a PSTN user need to be configured when the default configuration is not consistent with the actual application. 1. Run the sippstnuser attribute set or sippstnuser attribute batset command to configure the attributes of the PSTN user. 2. Run the display sippstnuser attribute command to check whether the attributes of the PSTN user are the same as those in the data plan. This topic describes how to configure the SIP interface system parameters including the overseas version flag and message waiting indication (MWI) mode according to the local standards to ensure that the response of the user terminal complies with the local standards. Step 1: Run the system parameters command to configure the system parameters. Step 2: Run the display system parameters command to check whether the system parameters.